Not sure how to harvest and store potatoes and now you have a bumper crop to put up for winter? Don’t worry! I’ve been growing, harvesting, and storing potatoes for quite some time now and I’m going to share the basics, along with helpful tips. 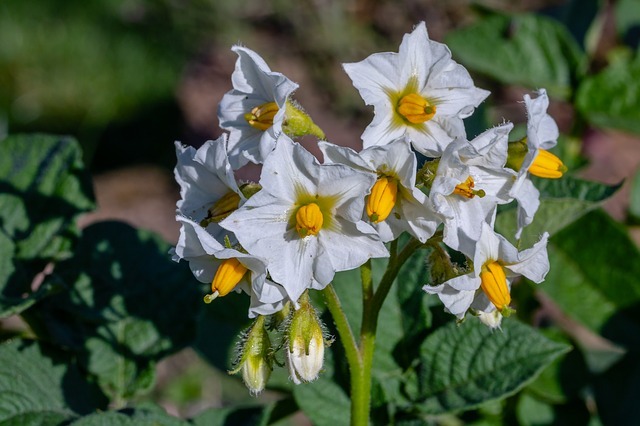 Potatoes are beginning to form once you see flowers…but don’t rush to dig them up! 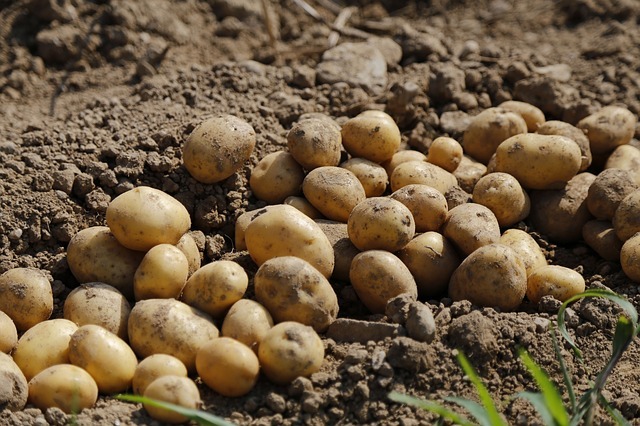 You may begin digging potatoes for fresh use 2 or 3 weeks after the plants start flowering. They will be rather small at this stage, and if you want the most productive harvest you’ll need to wait until the top of the plants turn brown and die back. I plant extras so that we can harvest our spuds from the beginning of July, continuing until I harvest the rest of the crop and store them in the basement. You can also read my post Harvesting New Potatoes where I describe how I harvest a few potatoes without sacrificing the entire plant. Once the tops die back, the entire crop may be harvested and stored in a cool, dark place. 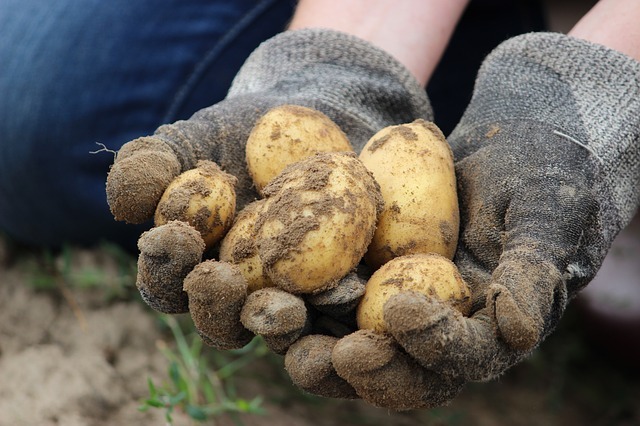 Harvest your potato crop on an overcast day when the soil is fairly dry and temperatures are warm. Using a potato fork or shovel, dig from the outside of the hill or row of potatoes. Place the fork so that it is vertical and you are digging under the hill. This will help ensure that few, if any, of the potatoes are damaged as you dig. Turn over all of the soil from the hill, unearthing your spuds as you go. Allow them to dry in a shady spot for an hour or so and and gently brush off dirt before bringing them in to cure. Do not wash your potatoes! A variety of different spuds. When potatoes are first dug, the skin will be rather fragil and easily damaged. 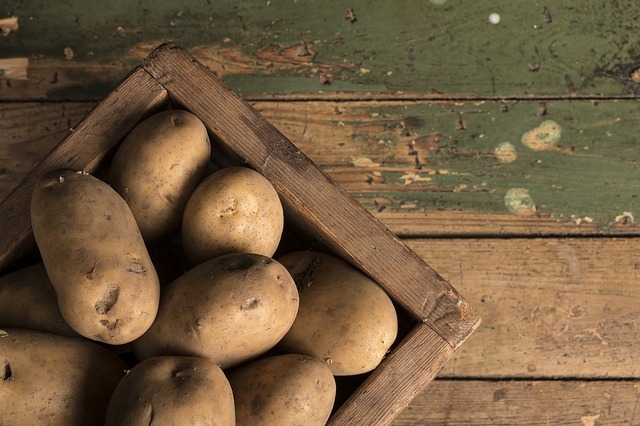 Spread your spuds out in a single layer to cure for 1 or 2 weeks for best storage qualities. Cure them in a dark, cool (55 – 65 degrees Fahrenheit) place with humidity of 90% or so. This will help heal small cuts and scrapes, and toughen up the skin for longer storage. After this curing process your potatoes are ready for the winter. 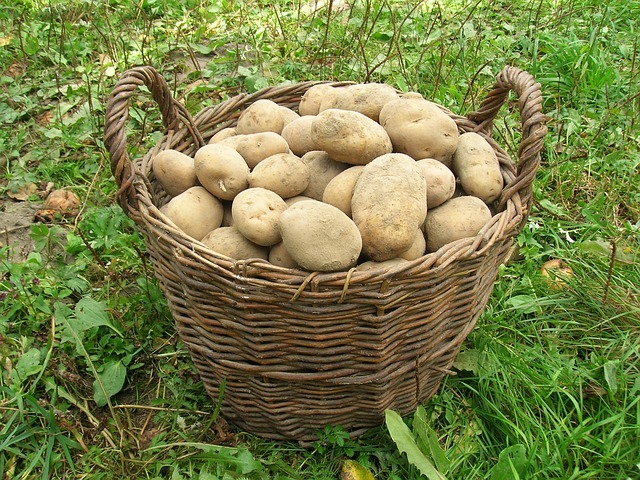 Place potatoes in slatted wooden boxes, baskets, or mesh bags to allow air circulation and prevent mold or rot. Use shallow containers so that potatoes are no more 3 or 4 potatoes deep, for the same reason. As you work, pull out any potatoes with bad spots and use these first. It is best not to store damaged vegetables with good ones, because as they rot they may cause perfectly good vegetables to go bad. Place containers in single layers in a cold (35 – 45 degrees Fahrenheit), dark, fairly humid (85% relative humidity or so) storage spot. Use clean bricks or boards to hold boxes up off of the floor and allow air circulation. Where Can You Store Your Spuds? Save mesh bags from storebought vegetables for storing your spuds. 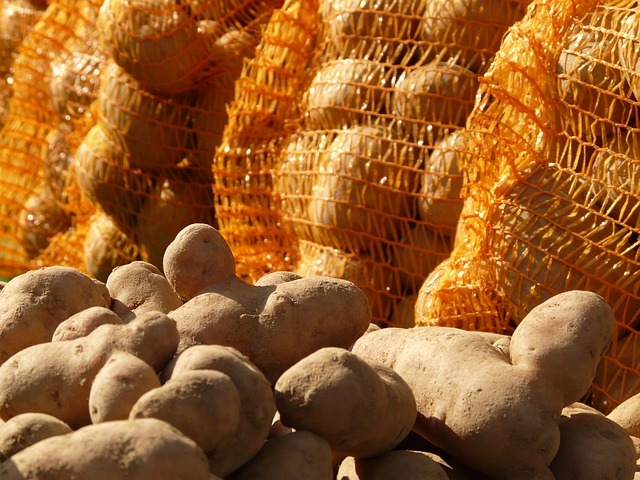 Plastic mesh bags that produce comes in may be cleaned and reused for storing potatoes. Hang the bags in your storage areas, leaving space between bags. Potato quality may deteriorate more quickly when stored close to apples and other fruits that release ethylene gas into the air. Any fruits in your storage area should be separated from the vegetables to prevent spoilage. Check boxes of stored fruits and vegetables often for mold or rot. Throw away any bad produce and clean the remaining produce with a mild bleach solution to prevent the spoilage from spreading. Well, actually, potatoes turn green when exposed to too much sunlight. 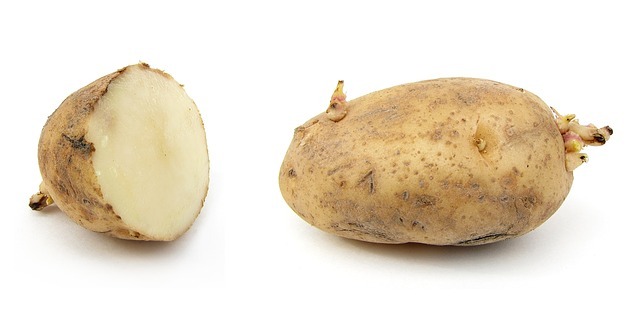 The chemical solanine causes the greening of potatoes and eating it can cause illness. So keep the sunlight off your spuds, and cut or peel away the green parts before you eat them. When humidity levels are too low, potatoes dry out and get wrinkled. Temperatures too high? Your potatoes will begin to sprout. 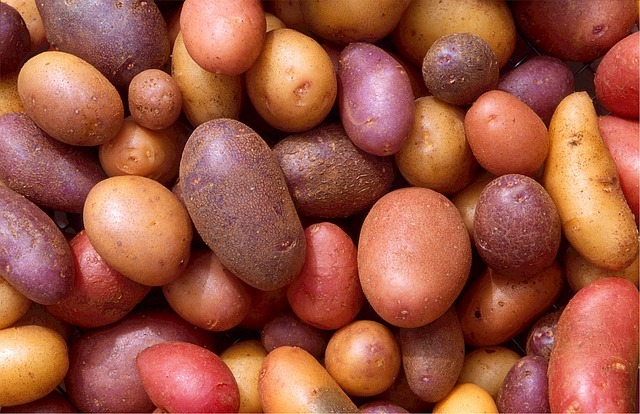 If you notice that potatoes are getting wrinkled, increase the humidity by placing a box of damp sand next to your potatoes. If they are beginning to sprout, move them to a colder spot that does not freeze. 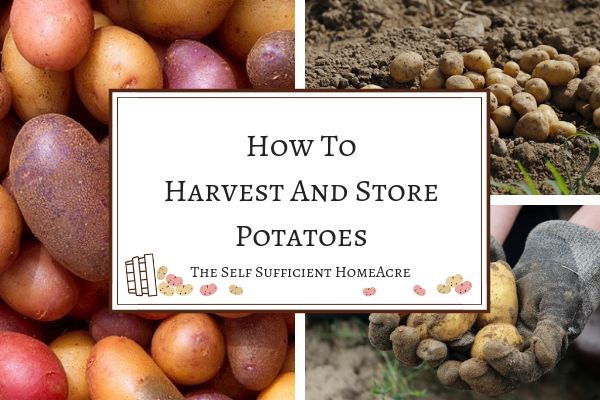 Harvesting and Storing Potatoes Isn’t Difficult! 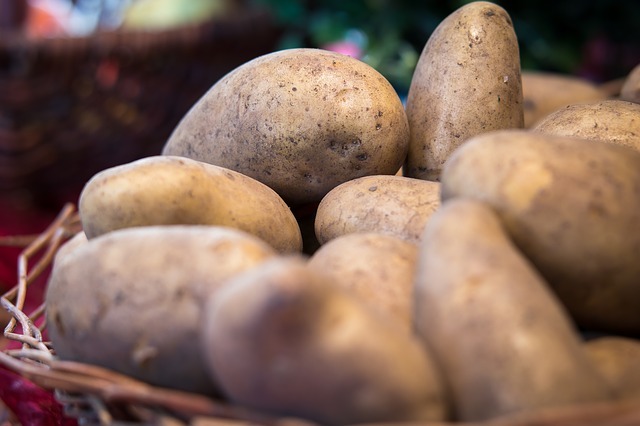 Growing, harvesting, and storing potatoes for the winter may not be effortless, but the energy that you put into this wonderful storage crop will be well worth it when you are eating from your harvest in the cold winter months. Remember to use up the damaged spuds first, keep the temps above freezing but quite cold, keep the humidity levels high…and you should have potatoes last all through the winter! 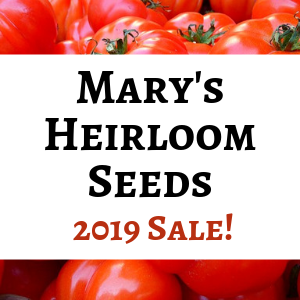 Growing your own storage crops is a great way to increase your food security, provide nutritious meals for your family, and reduce your expenses! Great info! We’re getting ready to harvest our first try in garage cans. Didn’t get much flowers, but I know there’s some down inside. Thanks! I still have a few more to dig and then I need to finish curing, then put them in the basement. I still have more squash to harvest and we had our first frost the night before last. Fall is really here!